There are several June birthstones, depending on the actual birthstone interpretation chart. Some authors enumerate as many as 10 stones that correspond to this month. The modern interpretation of birthstones includes Pearls, Moonstone and Alexandrite as the stones characteristic for month June. The second most popular interpretation, the traditional chart, speaks of Cat’s eye, Turquoise, Agate, and Alexandrite. Here, we will focus our attention to Alexandrite, Pearls, and Moonstone, as the modern classification suggests. The two Zodiac signs that share the month of June are Gemini and Cancer. Therefore, if you are born in either one of these signs, read on to find out what crystals, minerals and stones could be the perfect choice for you. The color changing Alexandrite is certainly the most expensive of the three, and even more so if you want to possess a gem-quality specimen. Pearls are also expensive, especially if you are looking for a genuine, non-cultivated gem. Moonstone is least expensive, but it doesn’t mean that you have to settle for an inferior birthstone. Some Moonstones can look fantastic, and be equally desirable as the most desirable precious stones. Whatever you choose, make sure that you purchase the real mineral. More often than not, birthstones are sold in a form of cheap synthetic replacements, like colored cubic zirconia, artificially produces quartz stones, or similar types. You wouldn’t want to go for them. Here is some interesting info about these birthstones. Even though Pearls are composed of calcium carbonate CaCo3, they are not minerals in the strictest sense of the word. They are produced as a result of the biological processes occurring inside the clams and oysters. That’s why, as a rule, their natural form is not perfectly spherical. More often than not they have uneven texture, poor luster, and surface imperfections that diminish their value. Therefore, spherical Pearls with even textures and specimens that are free of flaws on the surface are preferred. Their color can range from the most revered milky white, via silver, cream, gray, lavender, golden, and blue to the darkest shades of black. Pearls are symbols of purity, honesty, and loyalty. They are believed to bring protection, wisdom, and friendship. 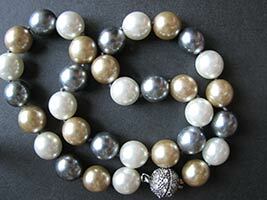 Pearls can be used in crystal therapy to treat digestive and heart related problems. The traditional Chinese medicine has been using them for centuries to promote positive mental states and as a cure for mental problems. Alexandrite is a variety of chrysoberyl. Crysoberyls are relatively rare stones, thus, their price is appropriately high. In addition to Alexandrite, Cat’s eye is also a member of this family and some birthstone tables also include this variety. Cat’s eye is also referred to as Cymophane. In composition, Crysoberyls are aluminum, beryllium silicates. Alexandrite has one remarkable feature: it changes color depending on the amount of light in its environment. 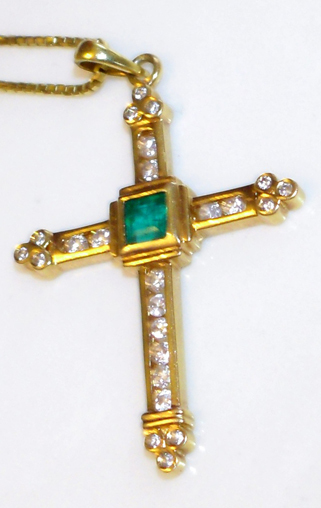 You can find small, unattractive Alexandrite stones for a couple of hundreds of dollars. 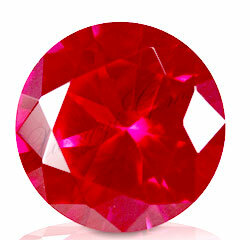 The exceptional gems usually cost as much as the most expensive diamonds. Alexandrite is believed to improve intuition, imagination, creative powers, and psychic abilities. It brings peace, calm, and harmonious emotional states to the wearer. On the level of the physical body, Alexandrite improves the heart and circulatory system. Moonstone is a type of feldspar. Most frequently, it occurs in blue, green, champagne, and peach colors. Moonstone of good quality should be of intense blue color and close to transparent. Some of its most prominent features are calming and soothing of emotions. Moonstone is filled with passive female energy and that is why it is believed to calm strong reaction and restore conscious control over our emotions. This June birthstone is sacred in India, where the popular belief is that it brings long and healthy live. In Hindu mythology, this stone is believed to be hardened moonlight. The other Eastern cultures also appreciate this gemstone very much. 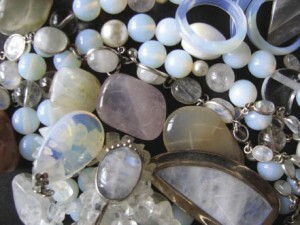 Moonstone is associated with moonlight virtually in all parts of the world. One of the widespread beliefs is that exchanging Moonstone rings between the partners at fool moon restores love and trust. Moonstone brings lucid dream, especially during fool moon. It is one of the stones that facilitate pregnancy and childbirth. As a healing stone, Moonstone improves the hormonal and digestive system and balances the metabolic processes. It is believed to help with blood purification, high blood sugar, and degenerative skin conditions. If the three described birthstones for the month of June are not amongst your favorite stones, here are some alternatives that have been used in different times and cultures: Emerald, Agate, Chalcedony, Turquoise, and Cat’s Eye. If you are born in the sign of Cancer or Gemini, feel free to choose one of these stones as your personal favorite. Usually, the one you are attracted the most is the real one. So, listen to your heart.